So it’s asparagus season! Which means I’m eating asparagus at least 3-4 times a week. Which means the cats are too! The other day I decided to make an asparagus tortilla and it was fabulous. Traditionally migas (literally: bread crumbs) was a peasant’s or shepherd’s dish, a tasty way to use up stale bread using little more than some garlic, olive oil, and whatever bits of meat or charcuterie happened to be about. At casa az, migas has turned out to be a great way to use up the bread scooped out of crusty loaves when making pan cristal (more on that later) and then fed to skinny flatmate who always needs to “carb up”. Obviously there are loads of variations on what can go into migas, as well as various ways of preparing it. What I’ve done, as usual, is look up a few different recipes and then make something that looks good to me, though on this occasion I *almost* burnt the garlic and onions… so try not to do that. 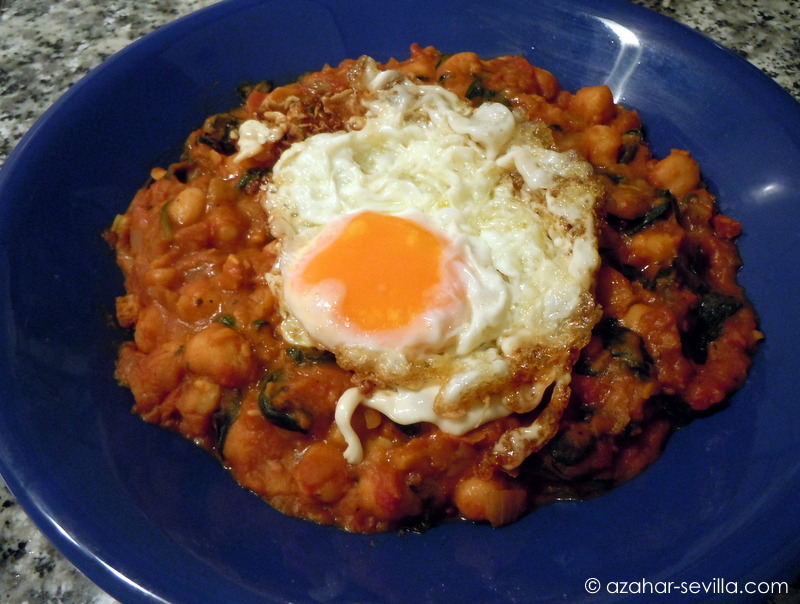 The other day I had a bag of fresh baby spinach that needed using up so I had a quick look online for some “spinach and egg” inspiration and found this, which as it turns out is a typical Spanish dish. I hadn’t planned on making a stew, let alone something with garbanzos, but this looked interesting and so after a few adjustments to the recipe I’d found I decided this would make a nice meal. And it was! I used chicken broth but you can swap that for veggie broth if you want a vegetarian dish. Serves two but just double the recipe for more people or to have some tasty leftovers the next day. A while back I posted a video that showed us how to peel a head of garlic in less than 10 seconds (still haven’t tried that one). And now… well, I’m sure you’ve read the title. Though I’m thinking this is only a good method if you are peeling (without peeling) an egg for yourself. You’ll see why. 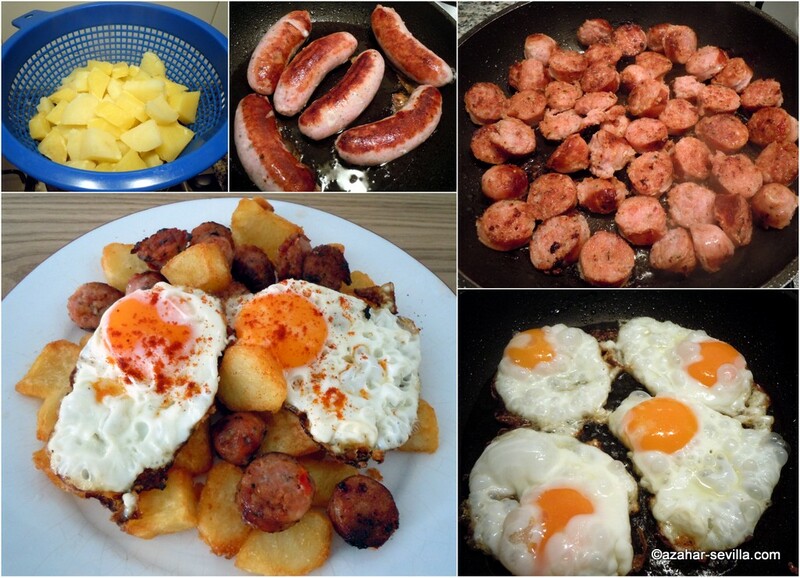 Huevos rotos (literally “broken eggs” in Spanish) is a very traditional dish with many variations, but all including perfectly crispy fried eggs with soft yolks and fried potatoes. The ones you see below include jamón and chorizo Ibérico, caramalised onions and shaved truffle. The one you see above is my first attempt at making this at home. I used chorizo criollo and added some pimentón piquante as my favourite version so far (from Vineria San Telmo) includes spicy chorizo with lots of pimentón inside, which blends perfectly with the hot egg yolk and fried potatoes. I served it with a tomato and spring onion salad, both of which are just coming into season now, and it was a great side dish that added a fresh touch and balanced the meal out quite nicely. 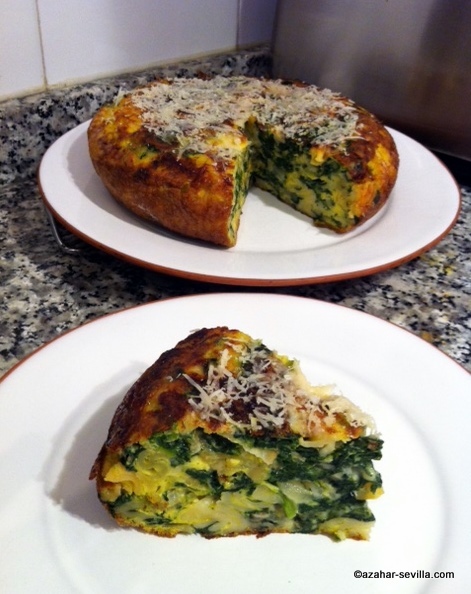 Today I was going to make a tortilla de patatas for my flatmate (really, you want to be my flatmate!) and then saw that there weren’t any potatoes in the house. So then I thought that I would try making a tortilla with pasta instead, which of course is a frittata. Which I have never made before. Except I didn’t want to have to bother with turning on the oven and all that. So I decided to try making a frittata but “tortilla-style”. Which means that instead of popping the frittata into the oven when it’s partially cooked, I would flip it and finish cooking it in the pan. And I think it turned out really well. One day I’ll try a proper frittata, but this is a great option for people who either don’t have an oven or, like me, can’t be bothered to use it most of the time. It’s also a great way to use up left-over pasta. This is a very simple dish that’s perfect for summer snacking as it will keep well in the fridge for at least 2-3 days. 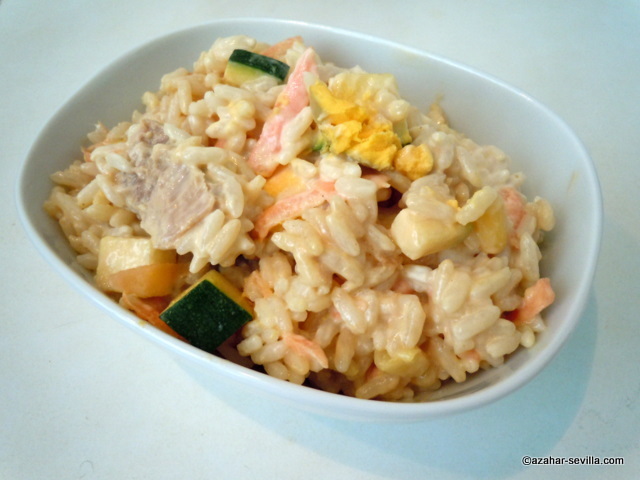 It’s also quite versatile, kind of like a risotto, in that the ingredients can be changed to suit personal tastes, including leaving out the tuna for a nice vegetarian option. This was originally made for me by a friend using only mayonnaise, but I find “salsa az” much lighter, though for this salad I leave out the garlic.